Conservation is extremely important to Great River Fishing Adventures. We are involved with many conservation organisations and we practice safe handling techniques. We at Great River Fishing Adventures are dedicated to the survival and rebuilding of the population of our White Sturgeon. The most crucial and pressing issues are the preservation and the conservation of this unique fishery. TheFraser River Sturgeon Conservation Society has initiated a very successful and rare tagging program, which has allowed for the ability to record data such as migration patterns and growth rates. The initiative taken by the anglers on the river to diligently tag and record data on all Sturgeon caught trips is what mainly has kept this fishery open and flourishing. 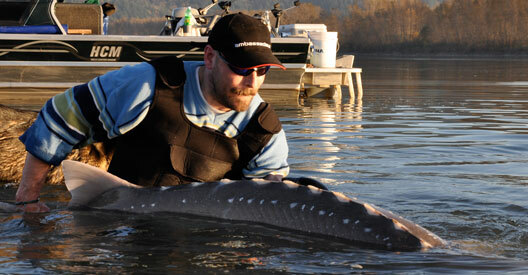 The catch and release tagging program has allowed British Columbia to be recognized as one of the top fishing destinations in the world for Sturgeon fishing. We work hand-in hand with the Fraser River Conservation Society collecting data on all Sturgeon that board our boats. This program also allows the unique opportunity for our guests to gain knowledge and have the amazing chance to get hands on and assist our guides with the tagging process. It is with this knowledge and understanding we can help our guests to appreciate this magnificent creature. Great River Fishing Adventures works with the science program and students at Southridge School located in Surrey, British Columbia. Southridge develops well-rounded students with a deep sense of personal integrity who have the moral character, love of learning and self-confidence to realize their full potential. Each student is encouraged and challenged to go beyond classroom academics and participate in personal development such as service learning and outdoor education. – Anna Szymczak – Co-coordinator and teacher Southridge High. The Sturgeon conservation trip that Great River Fishing Adventures helps to make possible allows for a cross curricular learning experience that addresses goals in both these areas. Students spend a portion of their science studies learning about the Sturgeon and importance of conservation. On the trip, students get the unique opportunity to meet the Sturgeon up close and in person, an experience that allows more of a memorable connection with the animal they are learning about. The students also get involved with conservation efforts, which allow the students to appreciate their natural environment through hands on programs, teaching key skills and developing leadership potential. At Great River Fishing Adventures conservation is an important issue to our team and we actively support and are involved in key initiatives and organizations. These organizations pay special attention and recognize the importance of protecting our natural resources and are established to act as environmental stewards. Both publicly and privately funded these many organizations are making great strides to ensure that British Columbia’s resources will be here for future generations to enjoy.